[dropcap size=big]W[/dropcap]hen one thinks of Cyberpunk imagery one doesn’t necessarily think about adding queer themes to their story. However, with Technobabylon James Dearden wanted to include some examples as a way of showing how far society has come in this area. While I can talk about these instances on my own, I reached out to James himself for some insight on the topic. 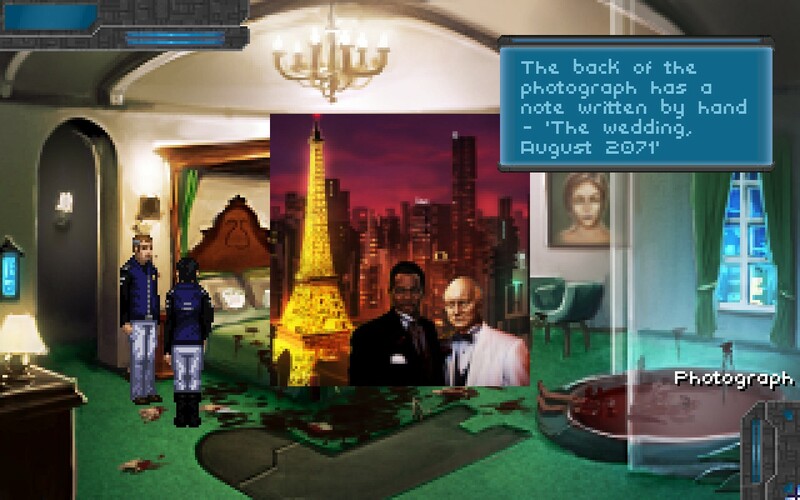 First off, I want to point out that Technobabylon takes place in the 2080s. Society in the future can be quite different than it is now and the way that Charlie Regis reacts to finding out the below information reflects in how accepted the gay, lesbian, and transgender community is in Newton. Or at least how common it is that nobody bats an eyelash. In fact, as we play through the game there is pretty much nothing that is “taboo” in the city. Even eating human flesh, albeit cloned human flesh. 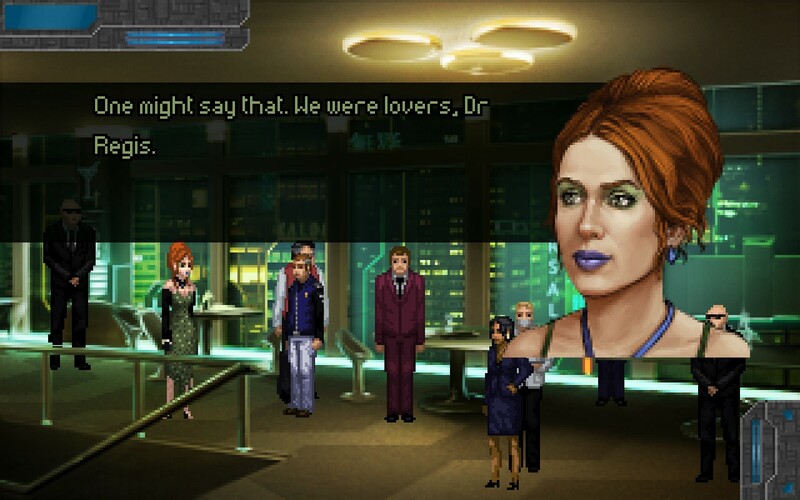 Early on in Technobabylon both Charlie Regis and Max Lao are sent to investigate the death of Giel Van der Waal and his husband. As grisly a sight as it is, we find that their relationship was a pretty deep one. Thanks to a picture found in the bedroom we discover that they married in Paris and due to a flashback we discover that despite the older gentleman’s past dealings with the criminal underworld they still loved each other. The thing here is that nothing is mentioned beyond the matter at hand. And speaking of Max Lao, Regis’ partner, we also find out that she is transgender. In a brief discussion about the Van der Waals’ deaths she tells him that she used to go to an all-boys school. This somewhat shocks Regis. Not necessarily because she used to be male, but rather that he had no clue at all. Frankly, he never brings this bit of info up again during the entirety of Technobabylon. To show that he’s not as old fashioned as he lets on, he thanks her for divulging this secret to him. I actually uploaded a video to my Youtube account with the full exchange. As a side note of the above conversation about Lao’s status as a transwoman, I want to point out that it used to be quite different. Dave Gilbert had approached me (and others) asking for advice on how to handle it and I gave my input. I had asked him if I could talk about this and he said yes. 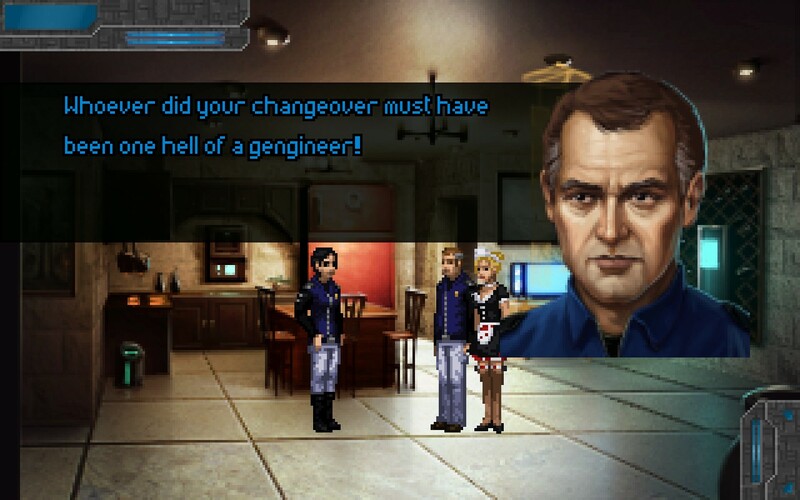 Throughout Technobabylon Charlie Regis proves that he’s rather old-fashioned, certainly in the technological sense, and the original discussion had him coming off as a bit…bigoted in this regard. I’ll be honest and say that I was rather offput by this exchange. I’m glad that it was changed to what it now is. Finally, and this is only very briefly shown late in the game, is that there was a lesbian relationship between Nina Jeong and Imogen…something-something during a clandestine meeting at the aforementioned “cannibal” restaurant. The only thing that shocked Regis was that someone actually fell in love with Nina. He couldn’t care less otherwise. Technobabylon is the selection for the June 2015 “Not Crowdfunded, But…” series. You can read more Technobabylon articles here. Previous articleWhat Kickstarter Video Game Campaigns Launched June 14 – 20?